Some microcontrollers may use four-bit words and operate at frequencies as low as 4 kHz, for low power consumption (single-digit milliwatts or microwatts). They will generally have the ability to retain functionality while waiting for an event such as a button press or other interrupt; power consumption while sleeping (CPU clock and most peripherals off) may be just nanowatts, making many of them well suited for long lasting battery applications. Other microcontrollers may serve performance-critical roles, where they may need to act more like a digital signal processor (DSP), with higher clock speeds and power consumption. 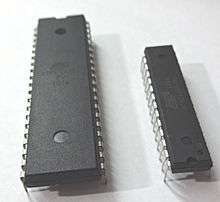 The first microprocessor was the 4-bit Intel 4004 released in 1971, with the Intel 8008 and other more capable microprocessors becoming available over the next several years. 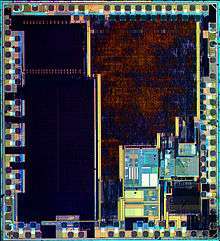 However, both processors required external chips to implement a working system, raising total system cost, and making it impossible to economically computerize appliances. Most microcontrollers at this time had concurrent variants. One had an erasable EPROM program memory, with a transparent quartz window in the lid of the package to allow it to be erased by exposure to ultraviolet light, often used for prototyping. The other was either a mask programmed ROM from the manufacturer for large series, or a PROM variant which was only programmable once; sometimes this was signified with the designation OTP, standing for "one-time programmable". The PROM was of identical type of memory as the EPROM, but because there was no way to expose it to ultraviolet light, it could not be erased. The erasable versions required ceramic packages with quartz windows, making them significantly more expensive than the OTP versions, which could be made in lower-cost opaque plastic packages. For the erasable variants, quartz was required, instead of less expensive glass, for its transparency to ultraviolet—glass is largely opaque to UV—but the main cost differentiator was the ceramic package itself. Historically, the 8-bit segment has dominated the MCU market [..] 16-bit microcontrollers became the largest volume MCU category in 2011, overtaking 8-bit devices for the first time that year [..] IC Insights believes the makeup of the MCU market will undergo substantial changes in the next five years with 32-bit devices steadily grabbing a greater share of sales and unit volumes. By 2017, 32-bit MCUs are expected to account for 55% of microcontroller sales [..] In terms of unit volumes, 32-bit MCUs are expected account for 38% of microcontroller shipments in 2017, while 16-bit devices will represent 34% of the total, and 4-/8-bit designs are forecast to be 28% of units sold that year. The 32-bit MCU market is expected to grow rapidly due to increasing demand for higher levels of precision in embedded-processing systems and the growth in connectivity using the Internet. [..] In the next few years, complex 32-bit MCUs are expected to account for over 25% of the processing power in vehicles. Recent microcontrollers are often integrated with on-chip debug circuitry that when accessed by an in-circuit emulator via JTAG, allow debugging of the firmware with a debugger. A real-time ICE may allow viewing and/or manipulating of internal states while running. A tracing ICE can record executed program and MCU states before/after a trigger point. When an electronic device causes an interrupt, during the context switch the intermediate results (registers) have to be saved before the software responsible for handling the interrupt can run. They must also be restored after that interrupt handler is finished. If there are more processor registers, this saving and restoring process takes more time, increasing the latency. Ways to reduce such context/restore latency include having relatively few registers in their central processing units (undesirable because it slows down most non-interrupt processing substantially), or at least having the hardware not save them all (this fails if the software then needs to compensate by saving the rest "manually"). Another technique involves spending silicon gates on "shadow registers": One or more duplicate registers used only by the interrupt software, perhaps supporting a dedicated stack. ↑ Augarten, Stan (1983). The Most Widely Used Computer on a Chip: The TMS 1000. State of the Art: A Photographic History of the Integrated Circuit. New Haven and New York: Ticknor & Fields. ISBN 0-89919-195-9. Retrieved 2009-12-23. 1 2 "Oral History Panel on the Development and Promotion of the Intel 8048 Microcontroller" (PDF). Computer History Museum Oral History, 2008. p. 4. Retrieved 2016-04-04. 1 2 "MCU Market on Migration Path to 32-bit and ARM-based Devices". April 25, 2013. It typically takes a global economic recession to upset the diverse MCU marketplace, and that’s exactly what occurred in 2009, when the microcontroller business suffered its worst-ever annual sales decline of 22% to $11.1 billion. ↑ Heath, Steve (2003). 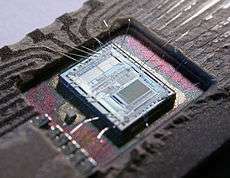 Embedded systems design. EDN series for design engineers (2 ed.). Newnes. pp. 11–12. ISBN 9780750655460. ↑ Mazzei, Daniele; Montelisciani, Gabriele; Baldi, Giacomo; Fantoni, Gualtiero (2015). Changing the programming paradigm for the embedded in the IoT domain. Internet of Things (WF-IoT), 2015 IEEE 2nd World Forum on. Milan: IEEE. pp. 239–244. doi:10.1109/WF-IoT.2015.7389059. ↑ Edwards, Robert (1987). "Optimizing the Zilog Z8 Forth Microcontroller for Rapid Prototyping" (PDF). Martin Marietta: 3. Retrieved 9 December 2012.